I hate being wrong. I’m such a guy when it comes to that. A co-worker and I headed out to the Allendale area for a job at Grand Valley State University. This is the same co-worker who obsessed with grinders. She kept saying there was a Mancino’s near GVSU and we had to go for dinner. I kept telling her no there wasn’t and I finally Googled it to appease her. She was right. There is. 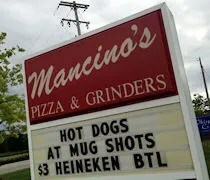 Mancino’s Pizza and Grinders is on Lake Michigan Drive about a mile or so west of GVSU’s main entrance. The multi-business sits along the busy Lake Michigan Drive just east of 48th Avenue in Allendale Charter Township. There we actually three of us today as we had an intern with us, so after finding out I was wrong, I asked the two ladies I was with if they wanted to grab a sandwich for dinner. Before I even got the words out of my mouth, co-worker said yes. We weren’t leaving the area with out grinders. 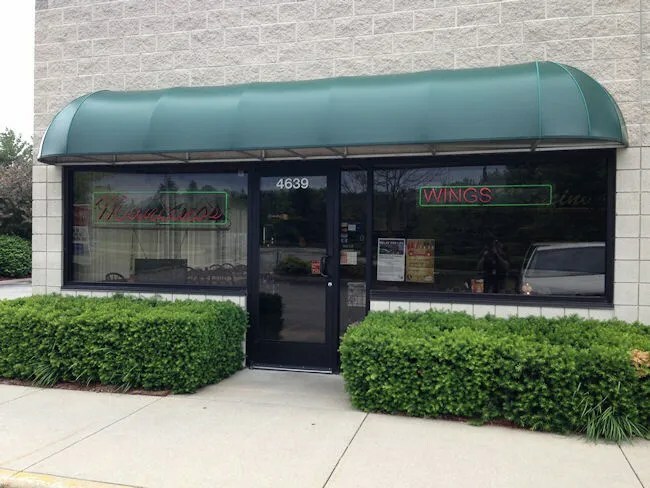 This Mancino’s is pretty close to campus, so it has a little more than just the typical Mancino’s fare. Sure, they have the pizza, grinders, and sandwiches you expect from Mancino’s, but they also have beer…..including a couple Michigan crafts. I didn’t even really need to look at the menu, so I stepped up to the counter first and ordered the whole pizza grinder like I always do. The whole 16″ sandwich set me back a little over $11. My co-worker actually ordered two half sandwiches. She had no intention of eating both halves, but wanted one for later. She also got a pizza grinder in addition to the Steak and Cheese grinder which comes with steak, mushrooms, onions, green peppers, cheese, lettuce, tomato, and mayo. Our intern ordered a half pizza grinder….so really, not a whole lot of variety in our group. The sandwiches took about 10 minutes to cook and we all grabbed them to go because we had more work to do. The two ladies ate theirs in the car, but mine was placed on the floor of the back seat until I could get some place to eat and not make a huge mess. The sandwich, as always, was toastedly delicious. The two, long slices of white bread had a nice toasty crust to it and the pizza in sandwich form is hard to beat. I’m very happy co-worker proved me wrong tonight. I never like passing up an opportunity to get a grinder and there was no way we were going to do that tonight.